The World Summit Award (WSA) is a global initiative to select and promote the world’s best e-Content. The WSA, held in the framework of the United Nations’ World Summit on the Information Society (WSIS), puts its emphasis on a core part of the Information Society that is often overlooked: high-quality e-contents and applications. By selecting, presenting and promoting the best products from all over the world, it makes a contribution to bridging the Digital Divide and narrowing the Content Gap. It involves representatives from 168 different countries on every continent and mainly focuses on the cultural identity and cultural variation. The WSA first phase took place in December 2003 in Geneva. The Geneva summit dealt with the most important issues concerning the development of the information society. The summit at that time involved representatives from 136 countries. The WSA second phase took place in Tunisia in November 2005 and 168 countries participated in the contest. As for this year’s World Summit event, it was held in Venice, Italy where 160 countries took place in the contest. The member of the Experts Committee referred to the method of selecting the winning website by an international Grand Jury convening each two years and consisting of 36 experts, technicians, academics, diplomats and businessmen in the field of information technology and e-content production who are selected from among 1000 experts from around the world. As for the present version of the WSA (2007), islamweb.net has won the Award as the best interactive edutainment website for Arabic-speaking children by the consensus of the Jury which met in Croatia, in evaluating the productions nominated from 160 countries, from which only 24- including Qatar - have won. The winning countries received their Awards in the 3rd and 4th of November in Venice, Italy in the presence of heads of states and world top officials. In a press conference held by Islamweb on this occasion, Mr. Yusuf Bin Ahmad Al-Kuwari, Chairman of Islamweb's Board of Directors, praised the website's services which qualified it to the WSA in the field of e-entertainment. In his speech, he highlighted the international outreach achieved by Islamweb in the field of information technology through its distinguished news and Fatawa (Islamic rulings). This distinction has enabled it to top all other Islamic websites and qualified it to many Awards, in addition to the UN reward it won for the second time. Furthermore, Mr Al-Kuwari ensured that the website will continue to develop through various prospective projects. Mr. Abdullaah Al-Dosary, general secretary of the Qatari Endowments Association, also addressed the Press Conference confirming that the Association's support for Islamweb comes as a result of the leaders' keenness to achieve the objectives of the association in serving the Muslims. Thus, the Association's board of directors did not hesitate to finance the website's projects in the way that enables it to deliver it in the world of information technology. This is embodied today in its winning the WSA for e-entertainment thanks to the immense efforts exerted by its Chairman of the Board of Directors, Islamweb Executive Officer (CEO) and its entire staff. On his part, Engineer Fahad Salman Al-Hajiri, Islamweb's CEO, stressed in the conference that what has been achieved such as winning the WSA for e-entertainment and the previous international success and achievements is all due to Allah's Favor then to the contributors in this successes, on top of whom is the Ministry of Endowments and Islamic Affairs - which is the sponsor and supervisor of the website-, the Qatari Endowments Association- which is the main financer of the website's projects- and finally the supportive efforts of the members of the Board of Directors and the Legal, Technical, and Administrative staff. Al-Hajiri added that the international achievement represented by the Award-winning of "Boys and Girls", which is one of the productions of Islamweb addressing children, comes to crown the continuously exerted efforts aiming at developing the website. Right from the establishment of the site in early 2004- under the title of 'Kids Corner', we took into account the needs of this segment of internet users. Later, the contents of this Corner were re-structured to form a complete website to which children may resort for constructive edutainment. The second version of this site was inaugurated in 2006 under the title 'Boys and Girls'. Furthermore, Mr Al-Hajiri, confirmed that the development and improvement of the kids site to reach its present level of quality was not aimed at achieving world awards; rather, to meet the needs of this important segment of the society. Mr. Al-Hajiri stated that the website has become the leading Islamic website according to the website: alexa.com due to continuous development; alexa.com is a search engine that provides information about traffic rankings. He also confirmed that Islamweb is looking forward to a bright future and continue the path of success and produce more successful productions. In the press conference, Mr. Isam Rafiq Alamah, a member of the committee of experts in the WSA for websites in Qatar, also delivered a speech stating that the international contest for selecting the best e- contents and applications worldwide aims generally at bridging the digital divide and narrowing the content gap. The contest focused on the cultural identity and cultural variation. Mr. Alamah also stressed the objectives for which the WSA was established, which was won by Islamweb for achieving the goals it strived for in the field of e-education, e-training, e-culture, e-civilization, e-practical applications, e-government, e-health, e-financing, e-business, e-entertainment and e-Inclusion. 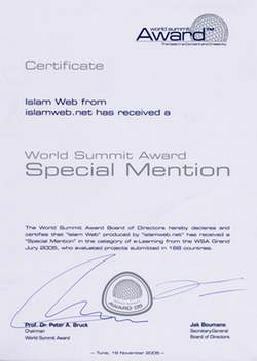 Finally, the WSA Chairman of the Board of Directors sent a congratulation letter to the general manager of Islamweb in which he stated that the Board of Directors had evaluated the website's production and selected it as the best national production in the field of e-entertainment in the State of Qatar for 2007 based on the recommendations of the Grand Jury of the UN Information Award, which is a world unique summit for choosing the best websites in terms of e-content and creativity.